As the term draws to a close we have much to celebrate. The College Showcase and Community Fair on Saturday 8 September was a huge success. It was lovely to engage with past, current and future families of our community. My sincere thanks to the many students and staff involved. The fair was followed closely by our College Open Day on Monday 10 September which was attended by 212 people including 20 new families. I was very proud of the students and staff as they were very professional and each of the Learning Areas produced high quality activities and displays. Our Tour Guides were exceptional ambassadors of our College. The College ACC Athletics Team worked hard in the recent B Division ACC Carnival. The standard is very high in B Division and the team did very well to remain in this division for 2019. Well done to Ms Wheeler, Sport Coordinator and our athletes for a strong team spirit on the day. 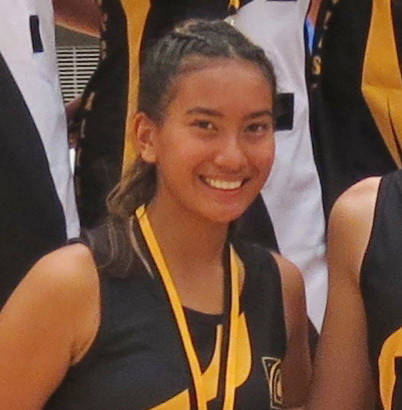 Congratulations to Nakeiyah Nguyen-Pitt Year 9 who was chosen to represent the ACC in the All-Stars netball match against the School Sport WA side at the State Netball Centre on Friday 14 September. Congratulations to Nakeiyah on a fantastic achievement and for representing Mater Dei. Also in the sporting arena, Rhiannon Clarke is the recipient of the 2018 Pierre de Coubertin Award. The Award is designed to reward not only the elite sports people but those that display strong character and ideals, representing the school at the highest standard both on and off the field. The Awards are held annually in each State and are presented to one Year 10, 11 or 12 student from participating high schools. The Australian Olympic Committee awarded 43 students in WA from among the approximately 16 000 students attending those participating High Schools. Congratulations Rhiannon! Our Space Campers are currently having an exciting time in the USA. After a long flight and airport delays, they have now commenced the experience of a lifetime. They look forward to sharing their stories on their return for the start of Term 4. Mrs Jacobs and Mr Raymond are also away with our students in Japan, enjoying a cultural immersion. Please keep all of our travellers in your prayers. 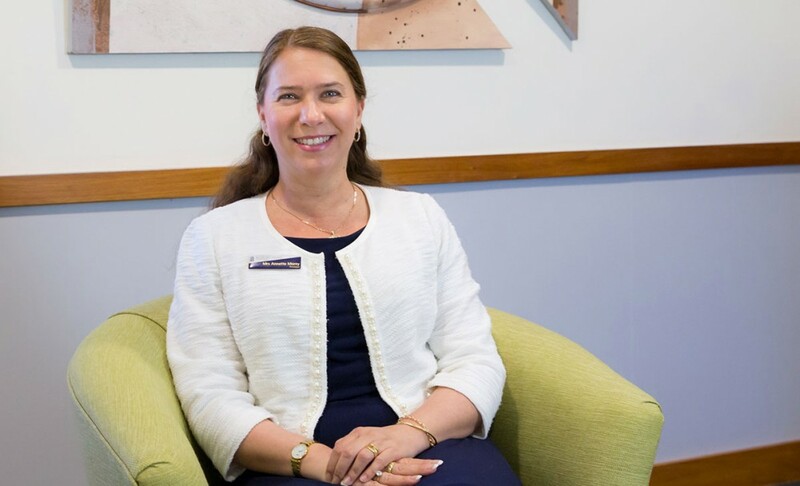 This past fortnight Catholic schools have been advised that Ms Debra Sayce has been appointed as Executive Director of Catholic Education WA. Debra has been Acting Executive Director since October 2017. She has a strong education background and experience in the Catholic system in Western Australia. We look forward to Debra’s leadership into the future. Earlier to today I sent an email to every family regarding the new Federal Funding arrangements for non-government schools. 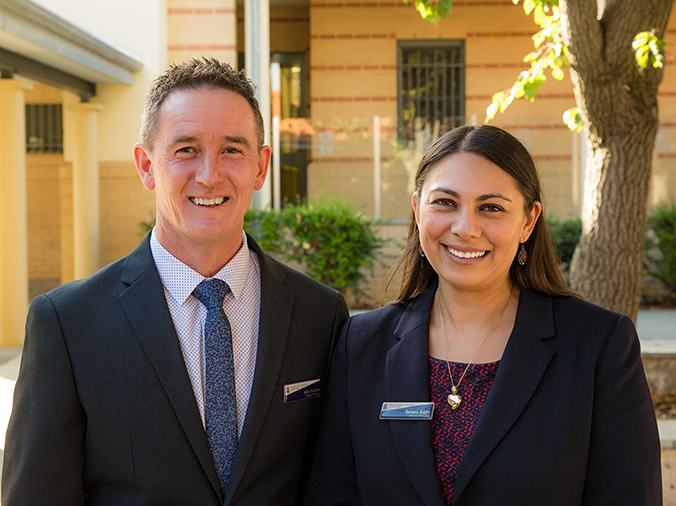 The new package will assist in maintaining certainty for the future for Catholic education in providing viable, accessible and affordable education for Western Australian families. At the final assembly for the year, we were pleased to have the company of Bishop Don Sproxton. Bishop Don was presented with a cheque for Lifelink from the Mater Dei Lap-a-thon. It was great to hear from Bishop Don and for him to share our final assembly for the term. Given that this is the final Newsletter for Term 3, I wish all families a safe and enjoyable school holiday period. A reminder: students commence Term 4 on Tuesday 9 October dressed in summer uniform. For most of our Year 12 students, the coming weeks will see them sitting a variety of examinations. I wish them every success as they complete these very important assessment tasks to complete their secondary education. 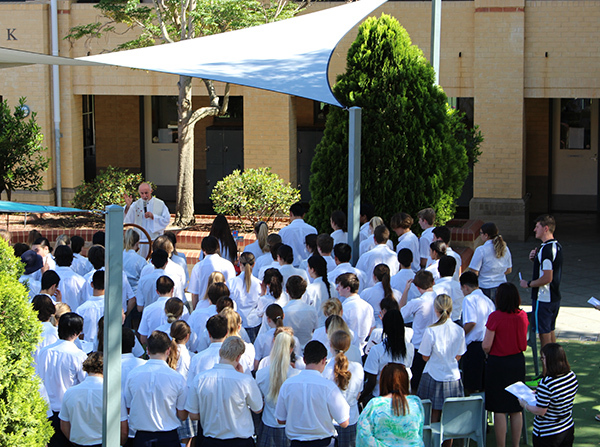 Please keep our Year 12 students in your prayers in the coming weeks and months ahead. Grant our teachers an abundance of Your wisdom. Prepare their hearts to welcome and love our loved ones, and may we make sure to show them love and respect in return. Give them grace as they help students who aren’t thriving, courage to say what needs to be said, tools and knowledge on how and when to speak love, and strength when they feel weak. When they feel unseen, remind them that no moment goes unnoticed. They are shaping the future in one million small - yet incredibly important - ways every day. We are overwhelmed with gratitude for the gift of learning they share with our children. Bless them, Lord, and may they see even just a glimpse of how their faithfulness will forever impact generations to come. the skills assessed at each year level and in each performance band. If you have any questions regarding the results please contact Mr Sullivan. Child protection is a sensitive and challenging area, and as adults we are all responsible for keeping children safe. It is a fundamental and non-negotiable responsibility of schools to provide a preventative curriculum, under the Department of Education Child Protection Policy. The KS: CPC does not replace the parent/caregiver’s responsibility to protect children and ensure their safety, and is not putting the responsibility on the child. It is designed to complement parents/caregivers’ roles and provides support for the learning of children. The programme is informed by a fundamental belief that children have a right to physical and psychological safety at all times and that by arming them with skills and strategies to recognise their feelings and take appropriate action or seek help, we give them another circle of protection. The KS: CPC can be accessed via the Code of Conduct and Child Protection Portal on SEQTA. If you have any questions or concerns about the Child Protection Curriculum and would like further clarification please contact Deputy Principals, Tamara Boyer and John Sullivan. In Week 9, Mater Dei College celebrated Science Week. The week started off with a fantastic display of the College’s diverse range of models, equipment and other resources while Mr Stuart thrilled the crowds with demonstrations involving the sublimation of dry ice. Throughout the week, Homerooms competed against each other to test their science knowledge in the annual Science Quiz and congratulations goes to Mrs Stuart’s Benedict C Homeroom, for achieving the top score! Students were also given the opportunity to apply their Chemistry knowledge to make sherbet and on Wednesday students could meet and greet a number of native Australian animals including a Dingo, a Koala, a Western Bearded Dragon and other snakes and lizards. On Friday, Science Week concluded with an Amazing Race competition between our House Leaders. Congratulations goes to Mercy for completing the race in the shortest period of time! Thanks to all the staff in our Science Department for volunteering their time, energy and expertise in celebrating all things science!! Earlier this year the Royal Australian Chemical Institute held its annual Chemistry Competition. This is a world-renowned event and is acknowledged as being the most challenging competition in Chemistry that can be undertaken, as many of the questions are set at a university level standard. Congratulations to all these students for an incredible performance in the country’s most difficult and prestigious Chemistry Competition. Our 2018 Showcase Art Exhibition was held on Saturday 8 September in the Salvado under-croft. In the lead up to the event the Salvado walls were transformed into a sea of colour. Murals from a range of year groups began to take shape. 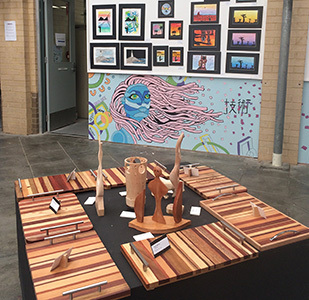 The Showcase exhibition is a chance for our students to exhibit a range of creative projects. We were blessed to have Genevie Baker from CEWA as our guest presenter this year. 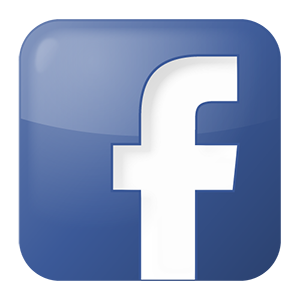 Genevie is the Visual Art consultant for Catholic Education Western Australia. She was visibly impressed with the quality and the variety of work exhibited this year. The opening of the exhibition and award ceremony was held in conjunction with the 25th Anniversary Fair. The two events provided a wonderful opportunity to showcase our College community and the valuable work that goes on behind the scenes. Student work consisted of small etchings, ceramics, paintings, wooden sculptures, furniture, arcade machines and graphic deisgn work. In addition, the College displayed our Pedal Prix Project and a range of student lead food stalls. The community atmosphere created was a credit to all involved. Well done to everyone involved in the production, in particular to the students who won prizes for their work. Last week, the Year 4 students from St Luke’s Catholic Primary School visited Mater Dei College for our second Mater Dei Discovery Day. The day was split up into two workshops/sessions which included visits to the Science laboratory and Art Department, where students were entertained by Mr Hurd, Mrs Valentine-Vagg some handpicked Year 10 ambassadors and myself. Personally, it was a wonderful opportunity to be able to introduce these budding young scientists to life in the lab at MDC. After observing various chemistry-based demonstrations, students then went into groups to discover organisms under the microscopes, look at the structure and function of flowering plants, and they also got to take home their slime, sherbet and seedlings. 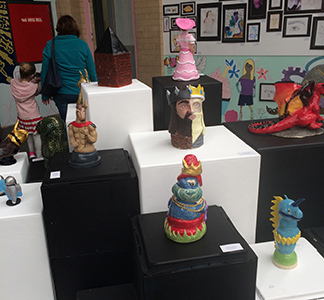 Whilst visiting the Art Department, students painted their own ceramic pig which were then displayed in the Showcase Art Exhibition the following weekend. I hope the students and teachers from St Luke’s enjoyed the experience and we look forward to welcoming these families to MDC in the future. The Year 4 St. Luke’s Catholic Primary School students put their reflections about the morning in their own words, below are a few selected examples. 1. I really enjoyed spending time at Mater Dei College. My favourite activities were studying Science and creating designs on our piggy bank. In Science we got to learn about what the high school students have been doing and we got to make interesting things. Designing our piggy banks because we got to paint whatever we wanted to paint and we got a tour around the Art room. We all loved the way you guys set everything up, especially for us. It was wonderful. It was all such fascinating information! We all enjoyed everything you taught us. Thank you so much for inviting us to your high school, we all had so much fun! 2. When we went to Mater Dei they had very nice teachers like Mrs Lombardo, Mr Longshaw and Mr Hurd. My favourite part of being at Mater Dei was the Science because we did all kinds of fun stuff and we got to see what all the kids have been working on. The Art was really fun because we got to customise a pig and put a really awesome designs like mine the galaxy pig and my friends the oinkachau pig. I had a really fun time and the Year 10s were really nice and were a lot of help. When we were looking around I really liked the engineering room. 3. My favourite activity at Mater Dei was painting the pigs because I really enjoyed drawing on them and making them look colourful. I also liked looking at everyone else’s pigs and seeing how beautiful and colourful they were. mMy other favourite part of Mater Dei was eating lunch in the cafeteria. I thought it was very cool. (I felt so grown up). I also liked looking at all the technology and especially the 3-D PRINTER and all of the amazing things that the Year Tens had made. The whole school was so amazing, neat and organised. Thank you so much. 4. Mater Dei was an AWESOME experience for me. I loved all the activities that they let us do and all of the fun things they planned for us like painting pigs (not real ones though). The thing that I liked the most was EVERYTHING especially the teachers like Mr Herd and Mrs Lombardo (they were really nice). Science was fun. I really enjoyed making the slime and sherbet. Art class was really fun too. We got to paint pigs using our own designs! My pig was a pikachu pig (Oinkachu was his name). What I liked about Mater Dei was that everyone was nice and friendly and very helpful. The Year 10s were especially helpful giving us tips and showing how to do activities the correct way. I think going to Mater Dei was the best excursion ever! 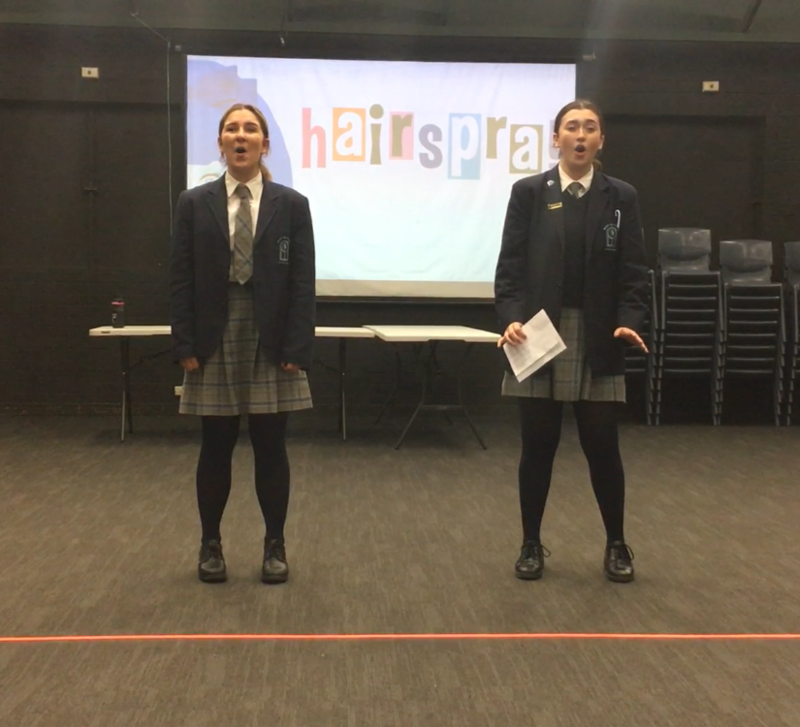 Following the announcement of the 2019 College musical in Week 5, the production staff were blown away by the hoards, of hairspray-loving hopefuls. A remarkable 104 students auditioned over Weeks 8 and 9, with the cast being announced in Week 10. This is a stunning line-up of talent and we can’t wait to start the rehearsal process, much of which will be initiated in early Term 4. To view a complete cast list please click HERE. Expect sell-out audiences in early May next year when Hairspray hits the Bernie Boss Hall! We are happy to announce that Lucas Stubbs from Madeley Primary School is the recipient of the Year 7 - 9 2019 Academic Tuition Scholarship. It is a very competitive process with prospective students being required to sit, an externally designed and administered, ACER academic test. Only two Academic scholarships have been awarded for Year 7 2019. We congratulate Lucas on his success and we look forward to Lucas joining our school community. To celebrate Children’s Book Week and English Week, students were invited to submit a piece of writing on the theme of “Treasure”. Below is the list of award winners. Participation Prizes: Eloise Duff, Ellie Evans, Jamie Ferguson, Kiara Hemetsberger & Fabian Weslowski. Thank you to all our budding writers that took the time to enter. Apple will be releasing their latest Mac operating system macOS 10.14 Mojave during the coming school holidays. We ask at the moment that students DO NOT update their MacBooks to this operating system. Mater Dei College IT Department have been testing this new operating system whilst in Beta and will continue testing once it is officially released. We need to ensure that the operating system does not cause any issues with our Wi-Fi network, printing etc before letting students update to macOS 10.14 Mojave. We will send out a new message when we have finished our testing, informing students when it is OK for them to update to macOS 10.14 Mojave. Many thanks for your help with this. 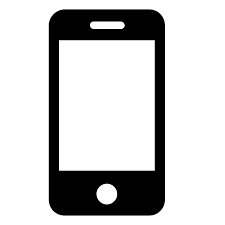 AppleCare offers end user support for all members of the Catholic Education of Western Australia ‘Mac’ community. This is a 24-hour 7-days a week support service, that covers ALL Apple hardware and software issues, accounts and settings. It is available for staff, students and families, regardless of the AppleCare coverage currently on their device. Congratulations to Nakeiyah Nguyen-Pitt in Year 9, on being selected to play in the ACC All Stars Netball Team. The team played the SSWA Team on Friday 14 September at the State Netball Centre. The girls were focussed from the start, maintaining their lead throughout the game with a final winning score of 42-21. The coaches commended Nakeiyah on her commitment. The office will be closed during Week 1 of the school holidays and will reopen Week 2, 9.00am – 3.00pm. The Year 7, 2020 enrolment process is now complete. We encourage all siblings to lodge an application for enrolment to ensure a future place at the College. Most vital human functions are accompanied by pleasure, and reading is no exception. I’m proud and delighted to be an Australian Reading Hour Ambassador for 2018, and to use the opportunity to gently remind the adult community that young people deserve that pleasure every day. They also need it, because no other activity will better equip young people to embrace their futures in a sometimes dark and uncertain world with optimism, resolve and creativity. Our stories have saved us in the past, and in the minds of young readers they can again. Closing date: 19 October 2018. 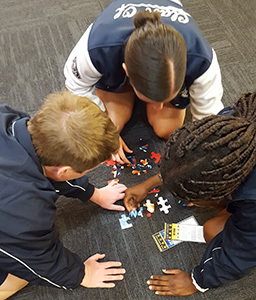 WAIS is running a Talent Identification Program for 13 – 17year olds from high schools across the State. Canoeing, rowing and cycling are currently looking for talented individuals to be included in their programmes around the State, with the potential to become an Olympian. Students are to register for the testing day this Saturday online using the below link (90-minute session). The day is free and will be at the WAIS High Performance Centre in Mt Claremont. The testing will potentially run annually.